Steven (Chicagoland, United States) on 18 December 2012 in Landscape & Rural and Portfolio. Bixby Creek Bridge, also known as Bixby Bridge, is a reinforced concrete open-spandrel arch bridge in Big Sur, California. The bridge is located 120 miles south of San Francisco and 13 miles south of Carmel in Monterey County along California Highway One. 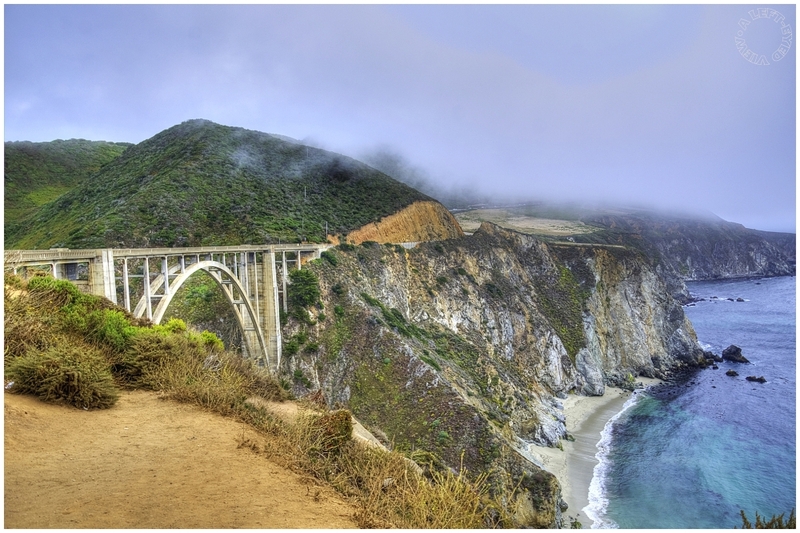 Prior to the opening of the bridge in 1932, residents of the Big Sur area were virtually cut off during winter due to the often impassable Old Coast Road that led 11 miles inland. At its completion, the bridge was built under budget for $199,861 and was the longest concrete arch span at 320 feet on the California State Highway System. It is one of the tallest single-span concrete bridges in the world and one of the most photographed bridges along the Pacific Coast due to its aesthetic design and location. Looks like a wonderful structure - I'm not surprised that it is photographed so much. Looks good against that backdrop of clouds and mist. so beautiful frame, colors, lights & atmosphere! An dem Motiv kommt man auch ohne Foto nicht vorbei. Sehr gut. Another marvelous landscape image. Excellent visual created by the bridge and the road. WOW! What a fabulous pov to take this lovely shot. Wondeful view! the angle is very nice on this shot. A grand setting for this beautiful bridge. Quite a shot ! Yes, a marvelous image if this fantastic sight. Just beautiful! Wonderful POV! I never tire of seeing this bridge and the coastline! Outstanding! An excellent shot in all respects.